RANCHO SAN DIEGO (4-10-2019) – Last season, Valhalla went undefeated to capture the Grossmont Valley League banner. Now, following the Lady Norsemen’s promotion to the Hills League this season, the Helix Highlanders are a perfect 3-0 in league play and are tied atop the Valley League standings with El Capitan. Valhalla hosted Helix in a non-league contest on Tuesday and it was all Highlanders as Zoe Kuhlken (4 1/3 innings) and Sophia Ramuno (2 2/3 innings) combined to shut out Valhalla en route to a 10-0 final. Helix struck in the 3rd inning – with one out, Erin Brown (2-for-5, RBI) singled. One out later, Nicole Hernandez (2 runs scored) hit a single, and Amber Young (1-for-3, 2 R) drew a walk to load the bases. 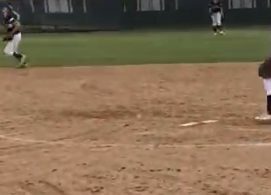 With two outs, Kasey Castro (2 runs scored) flared a ball into shallow right field, just off the edge of the webbing on the second baseman’s glove. The ball rolled into foul territory, allowing Brown and Hernandez to score. Isabella Bordine then reached via a hit by pitch (her 7th of the season), loading the bases once more. With the bases loaded for the second time in the inning, Kuhlken (3-for-4, 5 RBI) came to the plate, ready to help herself out and extend her team’s lead. She drilled a line drive into the outfield gap, scoring all three runners with a bases-clearing double, and bringing the score to 5-0. “I stayed focused at the plate and played my game by being selective with pitches,” Kuhlken said. In the 4th, the Highlanders struck again. Bordine, this time getting a chance to hit, singled, driving home Hernandez, who had reached on an error. Kuhlken followed with a 2-RBI single, driving home Young and Castro, who both singled. In the 5th inning, the Norsemen threatened. With runners on first and second and one out, Ramuno came in to relieve Kuhlken. As a team, we stayed very aggressive on defense, including two thrown out runners on the base paths, and did not make any errors. Ramuno induced a quick groundout for the second out, and struck out the next batter for the third. Ramuno would close out the game, striking out 6 of the 11 batters she faced. After the game, the Helix coaches praised their defense, giving special note to two individuals in particular: catcher Bordine, who threw out two runners attempting to steal, and right fielder Lizette Bernardino, who had her speed and glove tested while battling the strong gusts that made tracking fly balls quite difficult all afternoon. The Highlanders won their fifth in a row, and travel to Lakeside on Wednesday to take on the El Capitan Vaqueros in a matchup between the top two teams in the Grossmont Valley League. PATRICK HENRY 7, UNIVERSITY CITY 4: At University City, the Patriots captured their Western League opener by overcoming an early 2-0 deficit with seven straight runs. Sophomore catcher Dez Patmon led the way by batting 3-for-4, including a go-ahead, 3-run home to center field, when the Patriots tallied four time in the 3rd inning to secure the lead for keeps. Olivia Giganti added a pair of RBI, and was the winning pitcher with seven strikeouts in her complete-game in the circle. Patrick Henry (11-2 overall, 1-0 Western) also received a perfect day at the plater from third baseman Lauren Nett, who batted 2-for-2 with two walks, scoring twice. University City (7-8, 0-1 league) saw junior infielder Victoria Jacobo collect two hits. Even though Patrick Henry was the home team, the contest was played at the Centurions’ diamond due to construction delays on the Pats’ home field. FOOTHILLS CHRISTIAN 9, CLASSICAL 5: At Orange Glen High in southern Escondido, the Knights mounted a 9-1 cushion before they were tested by the Caimans in the 7th inning during Tuesday’s (Apr. 9) Pacific League contest. The Knights remain tied for first place with Tri-City Christian. Down 1-0, the Knights tallied five times in the 4th to take the lead for keeps. The first four came on four separate errors by the Caimans without a base hit, then No. 9 batter Genevieve Meyers tied off for an RBI triple to post a 5-1 advantage. In the 5th with the bases loaded, Holli Johnson singles and Josie Lopez walked, each getting an RBI. Oddly both rallies ended on Classical double plays despite the defense committing seven errors. 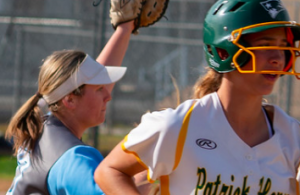 The Knights added two final runs in the 7th, Classical answered with five runs before relief pitcher Kaylee Guler was called to register the final outs. For Foothills Christian (7-4 overall, 4-1 Pacific), Johnson knocked in three runs, while winning pitcher Carissa Wolford batted 2-for-4. Classical (1-10, 1-4 league) received a double from sophomore Sarah Colleta. 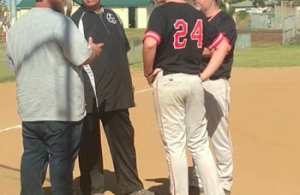 OUR LADY OF PEACE 13, CHRISTIAN 7: At Serra Mesa Recreation Center, the host Pilots skated to an early 9-2 lead through three frames, taking Tuesday’s (Apr. 9) Eastern League opener. Pilots sophomore Lorena Carrio knocked in five runs, including a 2-run homer to center field to build a 4-0 lead by 2nd. Solana Martinez and Michaela Castagnola also homered for OLP. Patriots shortstop Audrey Shebloski drilled a trio of extra-base hits. She smacked a pair of triples and a double for three RBI. “Down year is an understatement but we are grinding through it and hopefully our freshman gain some experience,” Shebloski said. “As tough as it’s been, I feel like i’ve been locked in hitting lately, especially the last two games. “Friday, we finished a game versus Mission Bay (CHS lost 14-8). I needed a triple to complete the cycle. (Shebloski was 3-for-3 with a home run, double, single and a walk) so today, it was funny, I got two triples. “I’ve been getting pitched a lot outside lately but today I hit one triple to left-center field on an outside changeup, one to right-center field on an inside changeup and the double was off the fence to dead center off of a rise ball. Meanwhile, left fielder Mallory Steele scored three times, once on a solo home run to left in the 6th. OLP (5-11 overall, 1-0 Eastern) s tied for first with Point Loma (7-8). which scored twice in the 7th to nip Mission Bay, 7-5. Mira Mesa was idle. Christian (2-10, 0-1 league) saw Dawnelle Mcleod match Steele with two base hits. SAGE CREEK 3, LIBERTY CHARTER 2: At Carlsbad, The Lions rallied from an early 3-0 deficit to make things interesting, but fell just short. Sarah Johnston popped a solo homer to lead off the 3rd. Then in the 5th, Lily Schallock drilled a lead double, later scoring from third base on a Jayden Ortiz ground. However, the Lions never could tie the contest, despite three runners in scoring position over the final three innings. For Liberty Charter (4-8) saw Schallock collect two base hits, while pitcher Katie Peet capped her complete game with 4.1 innings of shutout ball. Sage Creek (7-6) received a double from Sophia Gervais, plus RBI from the bottom of its batting order in Brooke Vinzinski and Chantel Taylor in the 2nd.